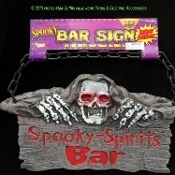 Spooky Spirits Bar Sign is made of poly resin and hangs with faux plastic black chain. Back of sign is smooth, flat and blank to allow writing chosen messages in chalk or paint as a two sided sign bonus! Serve refreshments with a twist when you decorate the bar with this Spooky Spirits bar sign. Guests will never be certain what sort of witches brew or love potion you might craft. Why not keep them guessing! Ghoulishly gothic kitchen dining bar pirate theme man cave prop decoration. Creepy faux weathered wood plank look would fit in fiendishly displayed in any pirate den or dungeon, indoors or out. Lightweight but durable, so you know it will not easily break in the off-season when it's stored away. Size: approx 18-inch (45cm) Wide x 9-inch (22.5cm) High. 14-inch (35cm) tall hanging height. Dimensions: approx 18-inch (45cm) Wide x 9-inch (22.5cm) High x 5/8-inch (1.56cm) Thick.